2018 was certainly a memorable year for Joe DeGuardia’s Star Boxing. Leading a year of many highlights was the highly anticipated return of former WBO Super Lightweight Champion Chris Algieri. On November 30th, Algieri ended a two year hiatus from the ring, winning a shutout unanimous 10 round decision over Angel Hernandez, before a boisterous sold out crowd at The Paramount in Huntington, New York. 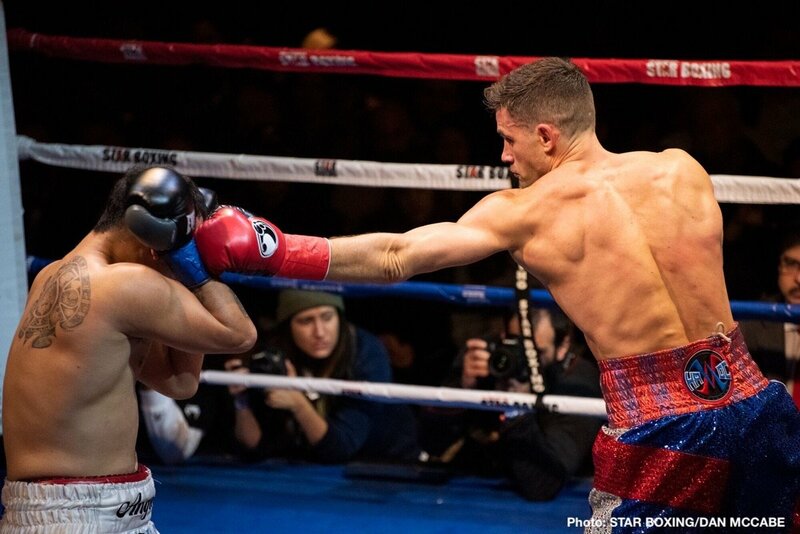 Algieri made his first title run as a staple of Star Boxing’s Paramount shows, and the Hernandez bout was a true homecoming for the Huntington Long Islander whose loyal fans continue to give their unwavering support. In dispatching Hernandez, Algieri left no doubt that the layoff has taken none of the luster off his superb boxing ability. In fact, under new trainer Andre Rozier, he has expanded his already ample fighting tool box. Algieri has never lost a fight at 140 lb. He is looking toward his next fight at the Hulu Theater at Madison Square Garden on January 18 (DAZN 6 PM) against stablemate Danny Gonzalez as the next step in a rapid path toward regaining the World Championship. The boxing world will be watching his return with great anticipation in 2019. 2018 also saw the successful return of Cletus “Hebrew Hammer” Seldin to the world stage. After looking sensational in his November 2017 appearance, destroying Roberto Ortiz (at the new Nassau Coliseum), Seldin suffered a severe elbow injury in his first loss against Yves Ulysses of Canada the following month, which required Tommy John Surgery. Cletus used the focus and determination he has so often displayed in the ring to work his way through a laborious rehabilitation and ten month layoff. Returning to the ring in November 2018, Seldin looked like a force of nature dispatching Nelson Lara in the opening round of a bout televised live on ESPN+ with his signature vicious body punching. Seldin appeared as sharp and as motivated as any time in his career, and left no doubt that he is a contender who must be reckoned with in the 140lb. division. Before his injury, Seldin had 3 fights in 4 months including two in consecutive months (November and December) on HBO, a distinction held by only Mike Tyson, Roy Jones and now Cletus Seldin. Less then 2 months after the Lara bout, Seldin will be back in the ring against veteran puncher, Hungarian, Adam Mate on January 26th, at Mohegan Sun, on his march toward a possible world title challenge at Super Lightweight in 2019. In 2018, Joe “The Beast” Smith, Jr. returned to form, displaying his vaunted punching power, with a convincing one round knockout of Melvin Russell in their 10 round light heavyweight contest held at Mohegan Sun in June. The bout followed Smith’s valiant 2017 effort against top rated light heavyweight contender Sullivan Barrera. After registering a first round knockdown against Barrera, the always dangerous Joe Smith Jr. fought bravely for 10 rounds with a severely broken jaw – demonstrating his blue collar, union-made American grit. The bout marked a temporary setback for Smith, who after thrilling many audiences at the Paramount earlier in his career, was coming off a spectacular 2016 where he was runner-up for fighter of year, upset of year and knockout of the year following his successive knockout victories over Andrzej Fonfara and legendary Bernard Hopkins. As one of the hardest punchers in boxing today, Smith is just one punch away from making himself a World Champion. Smith was scheduled to fight for the World Championship on December 15, 2018 at Madison Square Garden. However, World Champion Artur Beterbiev pulled out of the fight since his trainer was concerned that he needed more time to prepare against such a devastating puncher such as Joe Smith, Jr. Star Boxing promises to give Joe Smith, Jr. a World Championship title opportunity in 2019. Rhode Island’s Native Warrior, Kali “KO Mequinonoag” Reis, is a force to be reckoned with in the welterweight division and 2018 was the year in which Reis reminded the world of women’s boxing of this fact. Reis, the former three-time world’s middleweight champion impressed the boxing world in her performance on HBO against undisputed champion and #1 pound-for-pound female fighter, Cecilia Braekhus, by scoring a knock down against the welterweight champion, forcing the action, and giving her all she could handle until the final bell. While Reis is already deserving of another title shot, she intends to keep active until she gets it. In her last bout on October 18th, Reis continued to display her power and skill scoring a 6th round knockout over Szilvia Szabados in Washington, DC. Reis now looks to return home, to New England and put her full warrior spirit on display at the Mohegan Sun on January 26th on her way to another title shot. Another Star boxer who rose in prominence in 2018 was Danny “El Gallo” Gonzalez. Gonzalez made his mark before a sold-out crowd at the Paramount in September, in an engrossing, thrilling, tooth and nail war against Johnny “The Hitman” Hernandez. The crowd was so loud it was deafening. The bout was a war of attrition and proved to be a spectacular fight. Gonzalez finished a bit stronger as the ten-round epic battle came to a close with everyone standing and cheering. When the scores were read to a captivated crowd, the elated new ABO INTERCONTINENTAL CHAMPION, Danny Gonzalez dropped to his knees at the center of the ring in celebration. Gonzalez’s victory improved his record to 17-1-1 (6 KO’s). The win, his third straight of the year, all at the Paramount, earned him the accolade of ABO fighter of the year and a January 18, 2019 date with stablemate Chris Algieri at the Hulu Theater at Madison Square Garden. In Algieri, a former world champion, he will be facing he greatest test to date. With a possible world title opportunity and bragging rights in the Star Boxing stable hanging in the balance, Gonzalez is looking to make the new year the best of his career. Star Boxing was also thrilled to add two notable fighters to its roster in 2018. In July, undefeated welterweight and Detroit native, Ronnie “Teflon Ron” Austion was signed to a promotional agreement. Austion returned to the ring in November under the Star Boxing banner scoring a knockout victory. Ronnie currently fights out of Las Vegas, Nevada, and with Star Boxing’s guidance, will look to continue to defend his undefeated record, while setting his sites on the ultimate goal of earning a world title. Austion will be showcasing his skills on January 26th at the Mohegan Sun. In November, Star Boxing announced the signing of undefeated French super welterweight, former WBA Continental Middleweight Champion and current French Super Welterweight Champion, David Papot (Saint Nazaire, France, 22-0 3KO’s) to a long-term promotional agreement. Papot, who is currently rated the #9 Middleweight in the World (WBA) has successfully defended his French Super Welterweight title twice. Papot fought a total of thirty bouts with the French national team, reaching the quarter-finals of the European Championship. Star Boxing is poised to bring Papot international recognition and help him achieve world title aspirations. 2018 also saw the continuance of Star Boxing’s popular “Rockin Fights” series at the Paramount in Huntington, NY. CEO Joe DeGuardia showed his allegiance to the sport he loves by keeping the highly popular series as prolific as ever, maintaining its status as a centerpiece of the New York boxing scene. Star Boxing also continued its equally popular and long-standing “Slugfest at the Sun” series at Mohegan Sun Casino in Uncasville, CT.
Other Star Boxing fighters had success in 2018 including undefeated prospects Tyrone “Pretty Boy” James, who notched three victories in 2018, all at the Paramount, and displayed excellent punching power in maintaining his perfect record against Leo Carrizales in November, and “Action” Anthony Laureano who also tallied three victories in 2018, was named Connecticut’s Boxer of the Year and fights next on January 26th at Mohegan Sun. Fellow Star Boxing stablemates, Joel Tambwe “Big Joe” Djeko, Anthony Karperis, Johnny Hernandez, Danny O’Connor, Dean Burrell, Tyrell Bostic, Courtney Pennington, Michael Stoute, Valerio Nocera, Angel Suarez and Wendy Toussaint join us all in looking forward to 2019! Star Boxing found much success in 2018 from many different avenues including the sold out “Rockin’ Fights” series, the Mohegan Sun series “Slugfest at the Sun,” that is now being televised by NESN, the appearance of Star Boxing fighters on the likes of HBO and DAZN and Star’s excellent and continuing successful relationships with many promoters in the industry such as Golden Boy, Top Rank, Matchroom Boxing, and others. With the success of quality veteran fighters, and the signing of new and exciting talent, 2019 will prove to be yet another successful year for Joe DeGuardia’s Star Boxing.